You Have Chosen! – Answers To The Monday Question: Guerlain Or Chanel? The last Monday Question had quite an echo, many of you joined me in the ficitional imperative to choose only one of the two most esteemed houses – Chanel or Guerlain. So how did you choose? Since I am a bit slow when it comes to actually using computer programs other than Word or blogging software, I asked a pro, the lovely Undina of Undina’s Looking Glass, who is famous for her aptitude (and love) for numbers, to help me out. Thankfully Undina said yes, and proceeded to make wonderful graphs out of the raw data I gave her. Without further ado, here I present: The outcome of the last Monday Question in pictures. There have been 34 valid comments, 3 men, 31 women on the blog, and 22 votes on Facebook, 3 men and 19 women. 35 said Guerlain, 21 said Chanel. 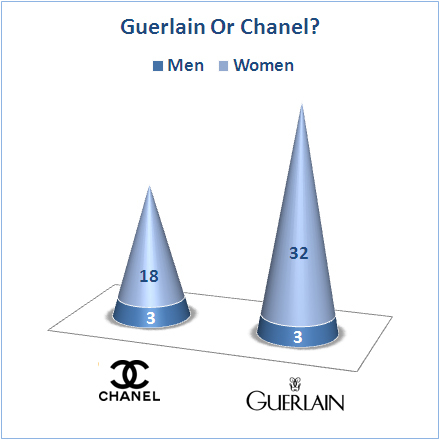 The men were equally impressed by both houses: 3 votes for Chanel and 3 for Guerlain, while the women favored Guerlain by far: 32 votes for Guerlain, 18 for Chanel. Furthermore, Undina registered every mention of Chanel perfumes made and converted that into this impressive image. Apparently N°19 is the most beloved Chanel perfume, mentioned 11 times, followed by Bois des Iles (10 mentions) and 31 Rue Cambon and Eau Premiere tie on the third place (9 mentions each). 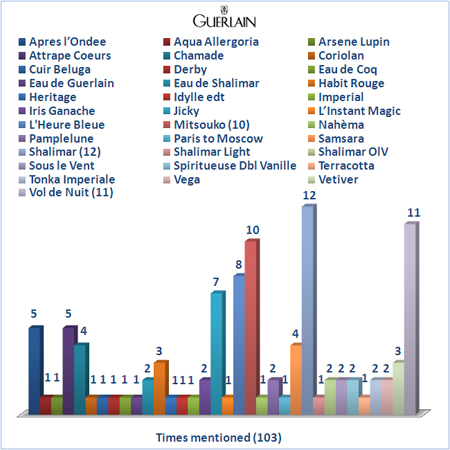 The same here for Guerlain: unsurprisingly Shalimar was mentioned most often (12 times), followed by Vol de Nuit (11 mentions) and Mitsouko (10 mentions). Guerlain is the clear winner, but many of us feel that Chanel is taking better care of its heritage. While Guerlain is loved and admired, we all fear for the house’s future. It is in the hopefully capable hands of Thierry Wasser to navigate this enormous legacy safely through the vagaries of IFRA and EU regulations and the LVMH patronage, and try to achieve the best possible quality of his perfumes, old and new. A big thank you to Undina for her help! This entry was posted in Chanel, Guerlain, Monday Question and tagged Chanel, Fragrance, Guerlain, Monday Question, Perfume. Bookmark the permalink. 36 Responses to You Have Chosen! – Answers To The Monday Question: Guerlain Or Chanel? Yesterday I stopped at the Chanel counter in order to get myself some Christmas presents and I spent some time chatting with the wonderful saleslady. I always tell her that I respect Chanel enormously for not having ruined their fragrances through reformulation and I told her about your poll. If Guerlain had taken better care of their heritage, I would still be a Guerlain girl. If we have to talk about the present, Chanel satisfies me much much more. I treasure my vintage Guerlain extraits, but the new ones I have tried left me cold. You are very right, and I still call myself a Guerlain girl, even though my vote went to Chanel. We don’t have a Chanel clothing boutique here. The fragrances (including Les Exclusifs) are sold at a Chanel makeup store where, fortunately, the salesladies are helpful and very knowledgeable. I am becoming a Chanel girl it seems. Undina did a great job. And we all had fun along the way. Oooh, I do love a good graph! I’m not surprised that Guerlain beat Chanel, both are amazing houses but there is just something about Guerlain, although I do love a good few Chanel’s and appreciate that they are one of the very few houses with a distinct style. Whoa, those are the COOLEST graphs! You and Undina rock! It was so nice of her to do all this work! This looks GREAT, wonderful job from both of you! I was still away in Paris at the time of your Monday Question, but my vote would have gone to Guerlain too, I’m affraid, just so many of my perfume loves come from there. I would have thought you’d choose Guerlain, Asali! This is fun-I am a guerlain girl, fr sure. Nahema is my newest love, but today I am sporting Shalimar! Guerlain perfumes are so tactile, while Chanel’s are more ephemeral, it does not surprise me that some many chose Guerlain—we’re sensualists, after all! I especially love that even some who chose Chanel, still consider themselves Guerlie-girls! 🙂 Somehow, depriving oneself of Guerlain seems greater than the sum of it’s parts. What a fun collaboration between you and Undina (thank you Undina! ), I hope we enjoy more to come! I intend to ask for Undina’s help again, ahould such a thing come up again. She did such a great job! Only tallying up all those perfume mentions I realized that I’ve ever smelled only 1/3 of all Guerlain perfumes loved by other people. So maybe, given an opportunity to try more, I also have a chance to become “a Guerlain Girl”? Thanks to everybody for all the kind words – you all made my day brighter. Thank you, Undina! I’m glad you are up for a repeat performance, should it come up! I was pretty sure that Guerlain would win. I cast my vote for Chanel, but could easily have sided with Guerlain. Both are wonderful houses that I will always have in my wardrobe. By the way, Undina’s statistical analysis reminded me of my time studying sociology (among other things) at university. Oh oh oh, I do love me a good bar chart! Thanks to you both for such an interesting presentation of the findings. My heart said Guerlain, head said Chanel (broadly speaking!). The division between head and heart is a good one!